Thermal transfer printers offers various benefits to manufacturers, more and more businesses discovering the profits of using one. Proving themselves to be more efficient, cost effective and reliable than traditional printers. Barcode ribbons have a wax, resin, or a wax/resin coating on one side. 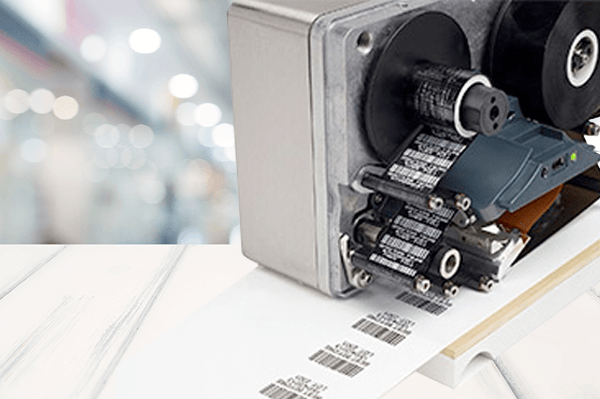 When a thermal transfer label or tag passes through a thermal transfer barcode printer, heat from the printhead melts the wax or resin. This process transfers ink to the label. The result is crisp, high-definition barcodes of the highest quality. Thermal transfer printers can produce consistent, reliable images on every label, are more durable and produces long lasting images. Thermal transfer printers print at a much faster rate than other printers and creating barcodes in milliseconds. Also are the most thermal transfer printers Windows compatibile, which means you can quickly import images, barcodes and text from your computer to your printer. Making the process as fast and easy as possible. Use less consumables with no ink or cartridges compared with other printers. Blanco labels on a roll and thermal transfer ribbons are the only things you’ll need to replace. This will ensure that your business spends less money on supplies. Maintenance costs are lower as they don’t need to be serviced as frequently as traditional printers. With fewer moving parts, thermal transfer printers are less likely to suffer jams, malfunctions and breakdowns. With our special cleaning wipes for thermal printheads you save the printhead lifetime as well. Thermal transfer printers are not limited to just plain old paper and they can produce on nearly unlimited variety of paper, polyester, and polypropylene media available. With a wide range of materials you can get your label exactly the way you want it. Overall, thermal transfer printers can create high quality and durable labels while saving your business time and money. Even if you look at the annual price increases, you can see that the market prices of thermal transfer printing are rising much less quickly compared to thermal direct printing.